In order for hot foods to stay hot and cold food to remain cold, it is important to understand the temperature limits of different containers in order to ensure the best performance. We often times receive questions from those who want to know if a foam container is microwave-safe or if our oven-safe products can go in the freezer. 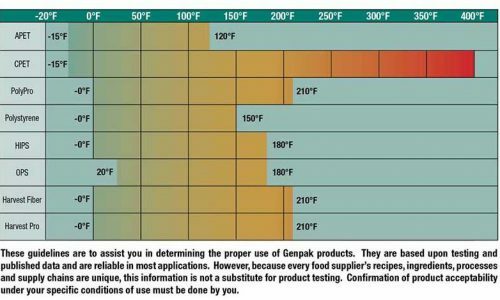 So, here’s a helpful guide that will help you understand your temperature limits to determine the proper use of Genpak products. PET is a solid plastic material most often used to produce water and soda bottles. PET is a versatile substrate that is widely accepted by most municipalities curbside recycling programs. Genpak’s PET containers included up to 30% post-consumer recycled content, in our conservational efforts to eliminate waste, and reduce the burden on the environment. There are two types of Genpak PET products that each have very distinct purposes: APET, which is safe for freezing and room temperature display and CPET, which is safe in the oven, microwave, and freezer. APET – Every food item has an expiration date, and APET is a great candidate for offering a longer shelf life. If you’ve ever come across any of our APET products then you’ve probably encountered our Clear Hinged Deli Containers, Clear Hinged Bakery Containers, Supermarket Containers, or Cold Drink Cups. Our clear APET products are perfect for savory, natural snacks, cookies, cakes, pastries, confectionary items, cold drinks and much more. Its structural integrity serves as a defense against oxygen to prolong the lifespan of a food item. This substrate also works well under cooler temperatures up to -20◦F, safe for a refrigerator or freezer. From transporting the container from one location to the next, consumers can ensure that it’s effective in preserving a food item without caving in or cracking open. CPET – CPET material is simply a crystallized form of PET, which is able to withstand very high temperatures for oven ready applications. Great care must be taken when using these products in the oven and we offer a Use & Handling sheet that can guide you through. These products are perfectly safe in the oven, microwave and even the freezer as it can withstand temperatures of up to 400°F. When microwave safe options are required for food packaging, polypropylene is the best choice of materials. Smart Set Pro, ProView, and Harvest Pro are the three product lines that you will want to consider. They are offered in colors such as black and white. We are also the only company to offer a unique textured PP material that allows us to produce products that are up to 20% lighter in weight than most other competitive items, without sacrificing strength or functionality. This translates into much less raw materials being used and lower product cost to our customers. Genpak’s microwave-safe containers include Proview, Smart Set Pro, and Harvest Pro. Temperature limit for Genpak’s microwave-safe, polypropylene products are 210° F.
Genpak Harvest Fiber material is manufactured from renewable resources and is 100% BPI certified compostable. The base fiber material for all of our products is bagasse, which is a byproduct of the sugar industry. Harvest Fiber products are microwave safe and grease & water resistant. Each item is engineered with ease of use in mind. Perfect for preserving temperature, whether hot or cold. In addition to our compostable products, the Harvest Paper product line consists of our paper cone, portion and drink cups. They are produced from raw materials originating from forests managed with Sustainable Forestry Practices and are all compostable. All of our Harvest Paper product configurations are engineered for maximum strength and durability utilizing box pleats, concave surface areas and rolled rims. Temperature limits for Genpak’s biodegradable and compostable products are 210° F.< For more information on temperature limits of Genpak products, you can always go to our Materials page where you can stay informed on different types of food packaging and recommended uses. This entry was posted on Tuesday, July 10th, 2018 at 8:00 am	and is filed under Environment, Genpak News, News Worth Reading, Product Spotlight, Recycling, Tips from the Packaging Pros. You can follow any responses to this entry through the RSS 2.0 feed. You can leave a response, or trackback from your own site.